Although The Devil’s West Laura Anne Gilman is writing in stands alone, its literary trail partners include Emma Bull’s Tombstone and Elizabeth Bear’s Karen Memory. Isobel, aka Izzy, who has been reared in the Devil’s house in the town of Flood, deep in the mystical Territory, makes a pact on her sixteenth birthday to assume a new role as the Devil’s Left Hand. She is sent out on the road to discover the significance of her new identity, and the responsibilities and powers that accompany it, with experienced rider Gabriel, a man with secrets of his own. Izzy confront magicians, bandits, and a host of natural and supernatural threats, as well as bone-grinding exhaustion and other challenges of the trail. A heroic fantasy by an award-winning author about a young woman who is trained in the art of the sinister hand of magic, but at what price? Isobel, upon her sixteenth birthday, makes the choice to work for the devil in his territory west of the Mississippi. But this is not the devil you know. This is a being who deals fairly with immense—but not unlimited—power, who offers opportunities to people who want to make a deal, and they always get what they deserve. But his land is a wild west that needs a human touch, and that’s where Izzy comes in. Inadvertently trained by him to see the clues in and manipulations of human desire, Izzy is raised to be his left hand and travel circuit through the territory. As we all know, where there is magic there is chaos…and death. A Locus Hardcover Bestseller, January 2016! "Silver on the Road feels like a story you've always known, but never read; the kind of haunting, perfect myth that draws together magic, the Old West, saints and sinners and innocents into a brilliant blend that's simultaneously startling and familiar." There's magic in the West, and weirdness not easily explained. The deserts are a place of ghostly silences and inexplicable sounds in the night. The mountains have a pull that is magnetic — the kind of thing you can feel in your sleep. The wind will mess with your dreams. None of this has anything to do with Laura Anne Gilman's new book, Silver on the Road. I lived in the west — spent a decade or more in what Gilman calls simply "the Territory" — and that's just the way things are. So she's chosen a fertile place to begin her new series (the broad plains, red rock and looming mountains of the American West), and amped up the oddity of it all by planting the Devil there as a card dealer, fancy-pants and owner of a saloon in a town called Flood. And the Devil, he runs the Territory. Owns it in a way. Wards it against things meaner than he is, because Gilman's Devil isn't exactly the church-y version. He's dapper in a fine suit and starched shirt. He's power incarnate — a man (no horns, no forked tail, just a hint of brimstone now and then) who gets things done; who offers bargains to any who come asking and always keeps to the terms because, as everyone in the territory knows, "The Devil runs an honest house." He never asks for anything you're not prepared to give, never gives anything that doesn't have a price. So when Isobel, who has worked since childhood as an indenture in the Devil's house, comes of age and has the chance to cut her own deal with Old Scratch, she gives the only thing she owns — herself — into the employ of the Boss and becomes the Devil's Left Hand. "The right hand gathers and gives, visible to all," he tells her. "But the Left Hand, Isobel, the manu sinistra? It moves in shadows, unseen, unheard ... It is the strength of the Territory, the quick knife in the darkness, the cold eye and the final word." In order to learn her new trade, Isobel takes to the road under the mentorship of Gabriel (yeah, no foreshadowing there...), one of a loose organization of "riders" who go from town to town delivering mail, carrying news, helping folks in need and just generally (conveniently) keeping an eye on things in the Devil's West (which, unsurprisingly, is the name Gilman has given to her new series, of which Silver on the Road is the first book). Gilman has obviously read her Joseph Campbell and memorized the 12 steps of the hero's journey. Isobel proceeds rigidly through the paces — daily life, the call to adventure and the appearance of a mentor. She sets off on her journey, learning and growing along the path. To Gilman's credit, Isobel thinks and acts like a teenage girl saddled with both great responsibility and mysterious powers might — particularly one who has grown up as a saloon girl in close proximity to the Devil himself — but that's just mechanics and good writing. No, what makes Silver on the Road readable and more than just an exercise in making mythology soup is that it all feels so ... pure. That's not exactly the right word, but it's close. The book has an internal logic that holds together. The strangeness feels honestly strange, but rooted in the land like it'd been living there far longer than there have been eyes to appreciate it. The magic feels real and dirty and grounded and dangerous and uncontrollable. The Boss is a force whose influence holds the Territory together. And the people who populate Gilman's west seem sufficiently steeped in this mess of Christian theology, Native American shamanism, homespun desert magic and a healthy dose of purely American Weird that suddenly seeing a talking rattlesnake on the trail spouting doom-y prophecy only counts as maybe the third or fourth creepiest thing that might happen to them in a day. All of which makes Silver take on the sheen and weight of forgotten history. Lost in the middle of the story, you'll feel somehow that you've always known the Devil wore a suit and ran a gambling house back in six-gun times, that he once sent a sixteen year old girl out into the world to fight monsters for him — and it's that echo in the brain that makes the thing hard to put down, because reading Silver on the Road is not like falling into some new and unfamiliar world. It's more like a true American myth being found. 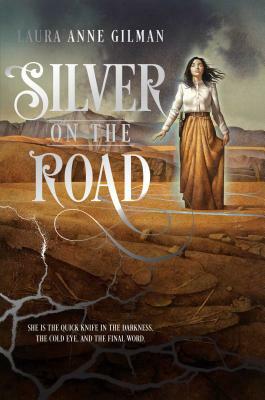 Silver on the Road marks a major landmark in the burgeoning subgenre of Weird West Fantasy, and in my opinion the best novel, on all fronts, that Laura Anne Gilman has written to date. Anyone vaguely interested in her work, or in Weird Westerns, should take the coin of the Devil and ride the road with Isobel and Gabriel to find out what’s in the Devil’s West. Isobel’s journey begins here and while the novel ends on a strong note, it is clear that she has miles to ride on the Road yet. I can’t wait for the sequel. Gilman (the Vineart War trilogy) takes readerson a scenic tour of a very weird Wild West in this delightful start to theDevil’s West series. In an early 19th-century America where superstition,magic, and unusual beings flourish, a man considered to be the devil has claimed a vast region west of the Mississippi that’s known simply as theTerritory. When saloon girl Isobel turns 16, she volunteers to work for thedevil and is appointed as his Left Hand, an agent to help keep the Territory under control. Under the guidance of her new mentor, the enigmatic Gabriel, Isobel sets out to learn the ways of the road and discover what her role trulyentails. A rash of supernatural events terrorizing the Territory forces Isobel and Gabriel to team with unlikely allies in hopes of preventing furthertragedy. Gilman skillfully plays with western folklore and history, infusing them with ambiguity and subtle strangeness to deliver a memorable adventure outon the untamed frontier. Refreshingly, her vision of the American West includes respectful portrayals of Native Americans. Isobel’s coming-of-age story is veryaccessible to teens, and there’s plenty for adventure-minded adults to enjoy as well. "[SILVER ON THE ROAD is] captivating, vivid, and impossible to stop reading... I could taste the dust, hear the rattle of the snakes, feel the wind, and sense the road. Filled with wonderful mythology and strong, compelling characters, this book is a fantastic start to what promises to be a fantastic new series." "I loved the worldbuilding in this story. I love that the Devil both is and isn’t the figure you’re used to. In some respects, particularly the Bargains he makes, he’s very familiar … and then you realize “Devil” is just a name, and you never truly learn what he really is. There’s power and mystery there. I look forward to the next book in the series!" "Reading Silver on the Road is not like falling into some new and unfamiliar world. It's more like a true American myth being found." "Silver on the Road will absolutely be on my Top 10 of 2015 list at the end of this year. This book is everything I wanted it to be plus more."